Container tracking solutions are evolving at an ever-increasing rate but many operators still have concerns about the cost of implementing such technology. The potential security benefits are clear but would the costs be too much? Is there a risk that security personnel would simply be swamped with data and still miss important events and indicators? MJC² has demonstrated that actually it is possible to simultaneously increase security AND reduce operational costs by implementing tracking technology alongside intelligent real-time optimization software. The CONTAIN project is an EC-supported initiative to increase security in container logistics operations, and a major component of the CONTAIN toolset is a set of real-time transport scheduling algorithms developed by MJC². The MJC² solution automatically interprets real-time tracking data while the container is on the road, comparing the actual activity against the plan. However, the most important aspect is that the system can also respond automatically to legitimate deviations from plan (e.g. traffic, delays, last minute orders), re-optimizing the logistics activity so that the operation is running as efficiently as possible at all times. This innovative use of real-time scheduling algorithms results in a highly controlled logistics operation with global visibility to increase security, while also saving money for the logistics operator that far exceeds the investment in the technology. The CONTAIN project has shown that (in real cases) hinterland transport cost savings of 10% can be achieved. The CONTAIN project is an ambitious undertaking which enhances container security at a global level. Involving 20 organisations ranging from security experts to logistics operators from Europe and the USA, and supported by the European Commission, CONTAIN addresses areas such as advanced sensors & detectors, intelligent monitoring & control platforms, and decision support & optimization systems. CONTAIN takes supply chain security performance to new levels in terms of effectiveness and efficiency. 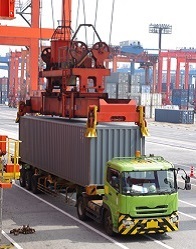 Not only does it drive regulatory, policy and standardisation initiatives, but it also provides port and transport operators with a set of best-of-breed technology solutions for sensors, communications, security hardware and software systems to enhance security throughout the logistics operation.